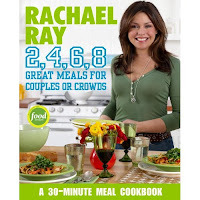 AOL's Bethanne Patrick interviewed Rachael Ray in connection with the release of Rachael's newest book, Rachael Ray 2, 4, 6, 8: Great Meals for Couples or Crowds. Rachael commented that the things she does every day, such as the 30 Minute Meals show and her talk show, helped her create the content for her 13 cookbooks: "It’s not like I sit down and just pump out a book every couple months." Rachael noted that she came up with the idea for 2, 4, 6, 8 because she was creating many date meals for her talk show and was doing menus for small gatherings for 30 Minute Meals. The idea that you could whip up something and feed six to eight people in a really short amount of time, people get really psyched about. That was - looking back over my year's worth of '30 Minute Meals' last year, that's where that inspiration came from. Plus, I think it's a real pain that all the recipes in magazines are written in fours, and it's a pain for people to try and figure out, well, if I'm making it for six or eight, do I really double everything, or do I need less and double of one spice or - it's tough for people. So this kind of makes it a lot easier. Rachael also noted that the recipes in 2, 4, 6, 8 were created while recognizing that the when you have a party, the "larger the number gets, the more simple -- the more simplified the menu has to get. So when you're talking about cooking for eight, especially in 30 minutes or less, you're talking about very simple roast vegetables, pork tenderloins, big pasta dishes." If I'm feeding 20, I think of it in smaller increments. I'll use two pans to cook one big thing. I mean, I'll use two pots. I don't have pans - most people don't in their home – that can accommodate properly the amount of food for 20 anything. So I'll make two pots side by side of stuffing at the same time. I'll make two pots of brussels sprouts at the same time and then combine them in a serving dish. There's nothing to say. They're - to each his own, and you can't be all things to all people. There's nothing to say to them. Everything they say about me is true. I'm not a chef, I don't bake. What am I going to say? Go door to door and say, can I pay you to like me? It's ridiculous. There's nothing to say.